We hope this finds you well as the cold, wet days of this year's October continue and autumn begins to settle in. This year, we have had the opportunity to collaborate with the Hosomi Museum in Kyoto in the launching of their current exhibition, "Mappo / Apocalypse- In Pursuit of the Lost Mushakuan Collection". The theme of the exhibition is Mappo, a period of some thousand years believed to have begun in the early twelfth century in Japan, in which the teachings of the Buddha were thought to have been lost, thrusting society into an apocalyptic state of chaos and unrest. The show features works of Buddhist art, including sculpture, painting, sutras, mirrors with engraved images of Buddhist deities, and more. The production of the exhibition included a great number of people, including contemporary artist Sugimoto Hiroshi, Vice-chairperson of the Eisei Bunko Hashimoto Mari, and Hosomi Museum Director Hosomi Yoshiyuki. 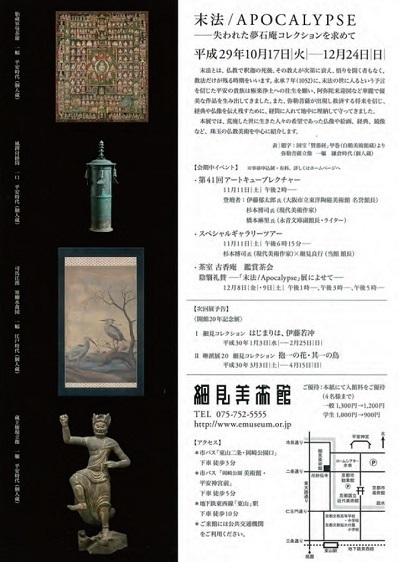 While the exhibition of National Treasures currently taking place at the Kyoto National Museum is attracting great crowds, this Mappo exhibition features exceptionally beautiful works of Buddhist art from the Tenpyo, Heian, and Kamakura periods, and is not to be missed. If you are in Kyoto this season, we hope you will take the opportunity to stop by and see the show. 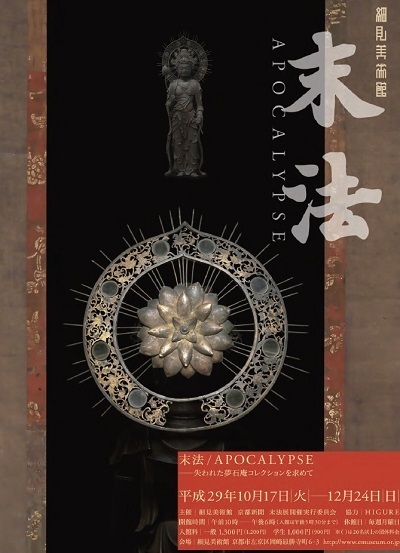 "Mappo / Apocalypse- In Pursuit of the Lost Mushakuan Collection"